Debris flows are defined as moving masses of rock fragments, soil, water, and air with more than half of the particles consisting of sand-sized particles or larger. Flash floods and heavy rainfall can initiate debris flows especially in areas where wildfires have burned off vegetation that previously stabilized the slope. Debris flows are dense - similar to landslides, however due to their water-sediment ratio and high pore-fluid pressures, debris flows behave and flow like water. In Nevada, these debris flows can flow out onto alluvial fans, through washes or arroyos, stream channels, and mountain gullies. Debris flows are common in many locations throughout Nevada with some more notable occurrences taking place in southern Nevada in 2016 after heavy monsoonal downpours, and in Douglas County in 2014 and 2015 following thunderstorms and heavy rain in the area of Johnson Lane. Several precautions can be taken to avoid some of the impacts of a debris flow. When traveling in the Nevada backcountry during inclement weather, make sure to avoid washes and gullies - do not camp or park vehicles in these areas. Many dirt roads follow washes and canyons that can become inundated with debris, as was the case with the truck shown above. Remember that debris flows can travel over large distances, so even if it is not raining in the immediate area, that does not mean the area you are exploring will not be impacted. Floods along major streams and flash floods along normally dry washes are all too common phenomena in Nevada. NBMG research is helping to understand the frequency and severity of past floods. Efforts are underway in southern, northwestern, and north-central Nevada to determine the timing, magnitude, and frequency of these events. Periodic flooding should be a major concern of property owners along Nevada's rivers and creeks and dry washes. The 1997 New Year's flood was a reminder of this for the people of northern Nevada, and the sporadic flash floods down the Las Vegas Wash are reminders for the people of southern Nevada. The numerous dry washes and arroyos across the state are commonly the sites of flash floods, especially during thunderstorms. The GBSSRL has a set of Federal Emergency Management Agency Flood Insurance Rate Maps covering the State of Nevada. These show the areas affected by 100-year and 500-year floods. These maps are indexed on paper but not electronically. The NBMG Publication Sales Office sells NBMG Urban Area Maps for flood and debris-flow hazards and slope, which use 7.5' topographic maps for a base. Flood and debris-flow hazards are available for Carson City 1Al, Genoa 1Cl, Las Vegas SE 3Al, Las Vegas SW 3Bl, South Lake Tahoe 2Al, and Washoe City 5Al. 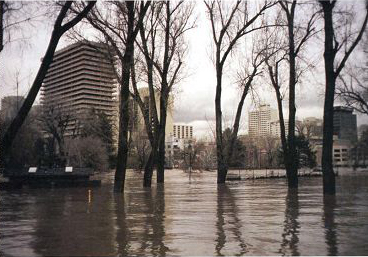 The NBMG Publication Sales Office also sells NBMG Special Publication SP-23 The 1997 New Year's Floods in Western Nevada, which details the 1997 New Year's flood and discusses earlier floods in western Nevada. The USGS has information on floods and flooding, and our website has a few publications on floods and flooding. For information on a particular site, one may also check with the local county engineer's office or hire a consulting geologist or engineering firm to do a site study. For information on flood control projects, one may also check with local county engineer's office, the U.S. Army Corps of Engineers, and the U.S. Bureau of Reclamation.